My daughter once jokingly staked claim to my stereo system upon my eventual death, just on the off-chance that my wife outlived me and my last will & testament wasn't crystal clear in the divvying up of loot. Don't judge. We like our humor dark in this family. At any rate, it's a moot point, because as soon as I showed her all of the pieces-parts that she was asking for--the amps, the power cables, the speaker cables, etc.--she changed her tune. "Too much hassle. Too much fuss." If she comes for a visit while I still have SVS's Prime Wireless Speaker System in my possession, though, I have a sneaking suspicion that she might change her tune right back. 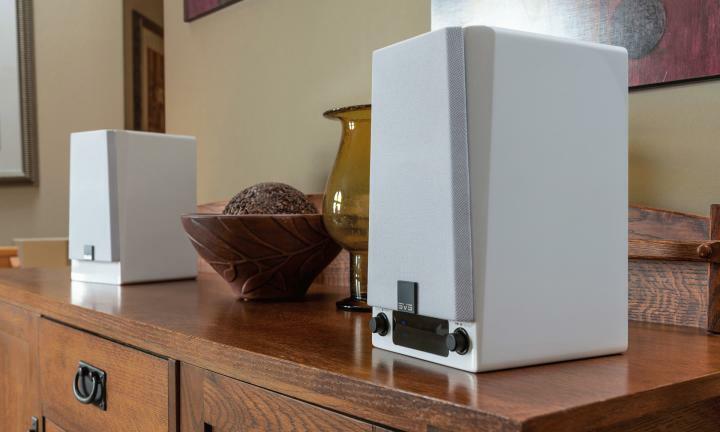 In short, the Prime Wireless Speaker System is everything that she imagines a good stereo setup should be: self-contained, simple, customizable and expandable but not laboriously so, with much better stereo performance than any one-chassis streaming speaker I've ever heard. In other words, if we want to hook future generations on hi-fi, this is the way to do it. Which isn't to say that massive amps and tower speakers and DACs and preamps and such don't have their place. Of course, they do. That's my bread and butter, and likely yours, too, if you're reading this. 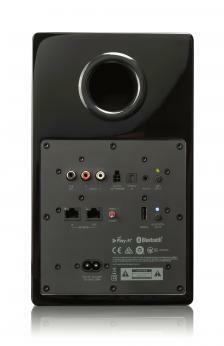 But as Andrew Robinson put it in his recent review of the Kanto YU6, "the future of audio and video is wireless." But enough with the philosophizing. Let's talk about the Prime Wireless Speaker System on its own terms. What we have here is a $599.99 two-speaker wireless system available in your choice of piano gloss black or piano gloss white. If you're familiar with SVS's non-powered Prime lineup, you'll certain recognize the aesthetics of this newer system. Its components parts--the powered right-channel speaker with all of the systems inputs, outputs, and amplification; and the passive left-channel speaker--boast the same aesthetic as the company's Prime Bookshelf Speaker and Prime Satellite Speaker, although in terms of height, width, and depth (10.24 by 6.1 by 7 inches), its cabinets falls pretty squarely between those two offerings. The right speaker also sets itself apart with its weight (9.5 pounds, versus 8.75 pounds for the passive left speaker), as well as its LED display and pair of small knobs, which play multiple roles. The left knob serves as the source selection and preset control (an important and distinctive feature we'll dig into shortly), whereas the right logically handles loudness control, as well as play/pause functionality. Included within the right speaker is a quartet of Class D amplifiers, each of which delivers 50 watts of power to the system's pair of one-inch aluminum dome tweeters and 4.5-inch polypropylene midrange cones. 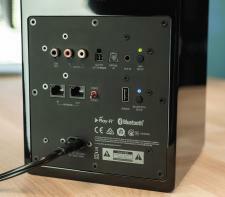 That speaker also houses the system's 192kHz/24-Bit DAC, Bluetooth receiver, physical inputs and outputs (including its subwoofer out, which automatically engages an 80Hz high-pass filter when employed) and network hardware, both wired and wireless. 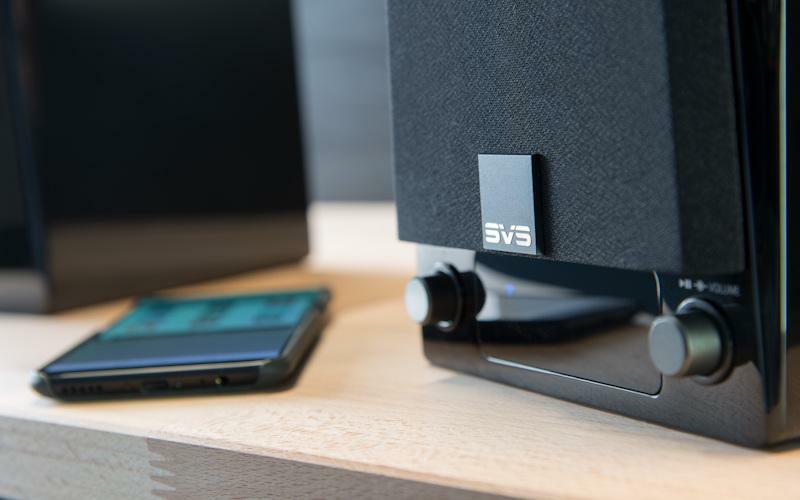 Despite its wealth of connectivity, setting up the SVS Prime Wireless Speaker System is remarkably straightforward. Its optical, RCA analog, and 3.5mm aux inputs work pretty much in isolation, and can be considered plug-and-play. As can Bluetooth, with support for both aptX and AAC. The star of the show here, at least in terms of input capabilities, is the Prime Wireless System's inclusion of Play-Fi, both for source-to-device wireless streaming of supported services (which run the gamut from Amazon Music to Deezer to iHeartRadio to Pandora, Qobuz, Tidal, SiriusXM, and the list goes on...), as well as its multiroom playback functionality. Some of you may be aware of my troubled history with Play-Fi, so I approached the setup of the Prime Wireless System with some trepidation. Despite the fact that I run an enterprise-grade Cisco/Ruckus network here at the house, previous Play-Fi systems I've auditioned either refused to identify speakers, randomly kicked those speakers off of the system for seemingly no reason, or just generally infuriated me with dropouts and unreliable connectivity. I don't know if it's just SVS' specific implementation of Play-Fi or a general maturation of the platform, but I never encountered any of those issues with this system. Since the day I pulled the Prime Wireless System out of its box, network connectivity has been rock-solid and drop-outs have been non-existent (and no, nothing has changed about my network since my last Play-Fi review). The Play-Fi app also now supports a feature that is, at the very least, new to me: Critical Listening Mode, which is accessed via a button at the top of the Play-Fi app. Engaging this mode disables network synchronization, but it enables direct-path digital decoding of high-resolution local files or streaming services like Tidal and Qobuz, at resolutions up to 192/24. All of this is merely to say that if you've avoided Play-Fi in the past due to reading about my experiences with the ecosystem, it may be time to take another look. In terms of both setup and day-to-day use, the SVS Prime Wireless Speaker System has been pretty much a breeze. I say "pretty much" there because there is one aspect of setup that I think most users will need to dip into the instruction manual to fully understand: Custom Presets. As I alluded to above, the presets allow you to lock in your six favorite music services, playlists, or Internet Radio stations, and instantly access them without pulling out your phone or tablet. Simply push the left knob on the right speaker, select from preset one through six, and your music starts streaming. Configuring these presets involves starting your stream of choice, holding the left knob of the right speaker for a few seconds, and waiting for numbers to flash on the LED display. I'll admit, it took me a few attempts to figure out the right combination of button presses and holds and such before I could reliably assign my preferred streaming sources to the preset number of my choice, but once I got it down pat, it was locked into muscle memory. And it was worth the effort. Whether you agree likely depends on how you choose to deploy the Prime Wireless Speaker System. If it's generally within arm's reach and you don't want to whip out your phone every time you want to listen to your favorite Spotify playlist, it's a super handy addition. And that pretty much describes my initial implementation of the system to a T. I first decided to install the speakers in place of my usual computer monitors: a pair of older Paradigm Shift A2 powered bookshelf speakers. Since the SVS system includes a handy optical input, I removed my desktop DAC from the equation and went straight from the optical output of my Maingear Vybe desktop media/gaming PC into the right speaker. Given that you use the same knob for preset selection and source selection, a setup like this could have been a navigational nightmare, but SVS has made the task of hopping back and forth between physical sources and streaming sources super snappy thanks to its source memory. What I mean by that is that I only ever needed to twisted the knob to select the optical input once. When I wanted to listen to my favorite Spotify playlists or other streaming sources, it was as simple as bumping the left knob on the right speaker, opening up the Play-Fi app, or selecting the speakers via Spotify Connect. Close the Play-Fi or Spotify or Qobuz app, and the speakers automatically switched back to the OPT input. Since both speakers in the Prime Wireless System are rear-ported, my chosen setup configuration did result in the need for a bit of finessing in terms of placement. In my typical setup, my desktop monitors reside pretty close to my monitor, flanking it on either side with perhaps an inch between speaker and bezel. 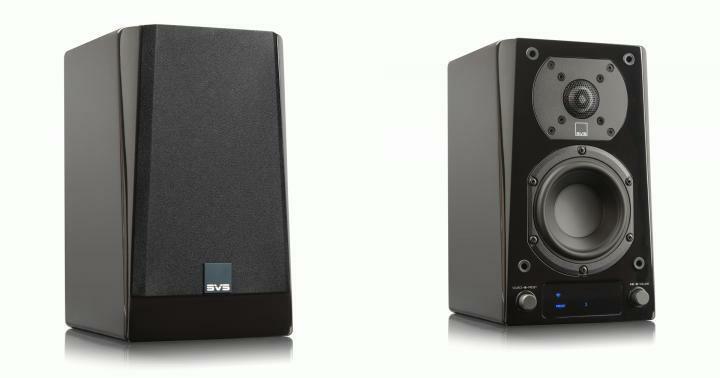 When I simply plopped the SVS speaker into the same position, I noticed a bit of unevenness in the bass performance, including a dip in response between roughly 180 and 200Hz that made the low-end sound ever-so-slightly disconnected from the lower midrange. I also added a pair of Auralex monitor isolation pads simply to give the speakers a bit of lean-back, since the surface of my desk is a little low, which resulted in the tweeters blasting straight into my chest when left to their own devices. If you're using the Prime Wireless Speaker System in a larger room, or in any other non-nearfield application, that last step will likely be unnecessary, as I discovered when I moved the system into my bedroom for some additional listening. 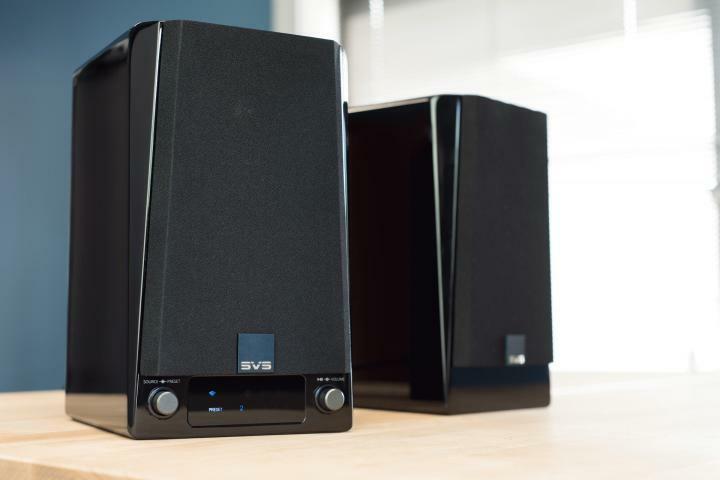 SVS Prime Wireless Speaker System Reviewed Don't let your kids hear SVS's Prime Wireless Speaker System.